Hi friends! It’s November, which means it’s time for something we do every year: brag about all the amazing food our customers will be cooking for that little holiday known as Thanksgiving. Due to limited space we can’t highlight everyone but we are super excited to tell you why you should dine with these fine folks below. Whether you’re cooking a meal at home or going out, whether you eat meat or not, there’s something delicious here for everyone. Read on! 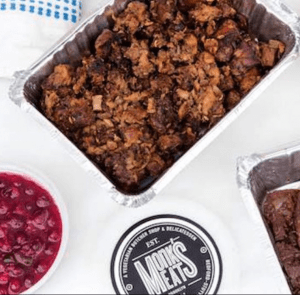 Monk’s Meats, a 100% plant-based and dairy-free “producer of modern American comfort food with a ‘Brooklyn’ sensibility and a healthy focus” is offering an extensive cruelty-free Thanksgiving catering menu! 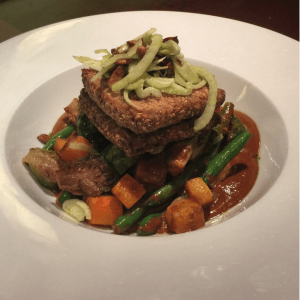 Choose from a variety of dishes inlcuding Truffled Seitan Steaks, Unstuffed Stuffing, Maple Bourbon Candied Yams, Cauliflower Gratin, Pumpkin Cheesecake, and more–or just ask for the “family feast” and get it all! Order by midnight on Nov. 20th. 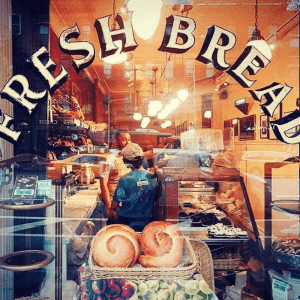 Ace customer Union Market, self-described as “your neighborhood source for fine foods” with locations throughout Brooklyn and Manhattan is offering something awesome: organic, hormone-free turkeys that you can order ahead! Says UM: “We know that you have a lot on your plate as turkey day approaches, so let us give you a hand with finding the perfect bird for your Thanksgiving Day feast, whether it’s one of our signature free-roaming birds, an oven-ready brined turkey, or a heritage breed or organic, pasture-raised bird.” They even offer something extra: their super-easy, super-delicious recipe for the perfect turkey, which includes dry-rubbing it with salt and letting it sit in the fridge overnight. If this sounds like your cup of tea, order before November 17th (although they suggest the earlier the better)! 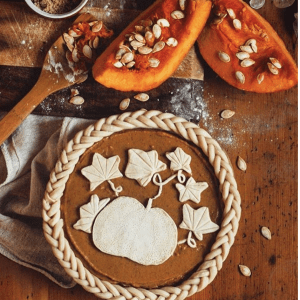 Veggie or non-veg, many would agree that no Thanksgiving is complete without some crispy bread or a decadent pie–if you’re one of those people, we suggest you look no further than Amy’s Bread. Those with a sweet tooth can choose between Amy’s Special Pumpkin Pie, Pumpkin Walnut Cranberry Quickbread, Apple Pecan Coffee, Pumpkin Pecan Knots, and more. Amy’s also offers a full array of cakes, cupcakes, breads, rolls and twists on their regular menu. 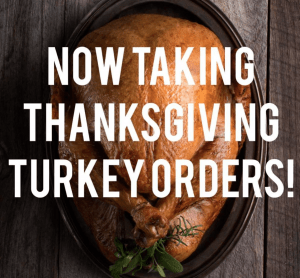 Order by 2 p.m. on Nov. 18th! If you’re looking to celebrate out on the town, Candle 79 offers a 100% plant-based prix fixe menu for Turkey Day. Start your meal wth an appetizer (we’d probably go for the Grilled Portobello Steak), then choose between a soup and a salad (options include Roasted Honey Nut Squash Soup, Beet Salad, Red Quinoa Salad, and more), and follow it all up with an entrée (our mouths are watering for a delicious bowl of House-Made Gnocchi). Dessert options include Pumpkin Cheesecake, Coconut-Chocolate Cake, Sweet Potato Pie, and much more. 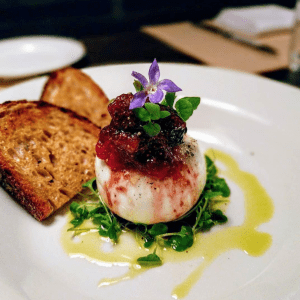 Diners also get a wine pairing with each course. Make your reservation today! 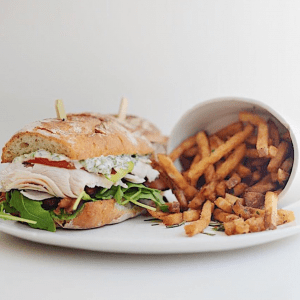 **Special note: Candle 79 is also offering a full takeout menu for Thanksgiving this year. If you’d rather dine on Candle’s yummy fare from the comfort of your own abode, place your order by 9 p.m. on Nov. 20th! Mercer Kitchen is offering a unique option: starting at 11:30 a.m. on Thanksgiving, diners can enjoy their regular dinner menu with Thanksgiving specials including Roasted Turkey, Caramelized Brussels Sprouts, Crispy Sourdough Stuffing, and Turkey Jus. 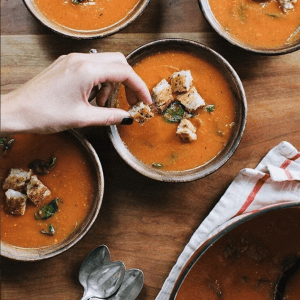 This is especially brilliant, as those who find that typical Thanksgiving fare isn’t their thing can treat themselves to Crispy Squid, Kabocha Squash and Ricotta Toast, Grilled Organic Lamb Chops, and more. Reserve your spot today! If a less traditional Thanksgiving meal sounds good to you, make a reservation with ABC Kitchen and dine off their fall menu. Revelers will be able to choose from creative plates like Roasted Portobello and Celery Leaves, appetizers including Shaved Raw Fluke, Gooseberries, Serrano Chilies and Lemon, housemade pastas including Ricotta Ravioli with herbs and tomato sauce, an array of artisanal pizzas, entrees like the Akaushi Cheeseburger with Herbed Mayo and Pickled Jalapeños, and sides including Sautéed Baby Hemp Leaves. Make your reservation today! We hope you found an option here that will make your Thanksgiving extra special. No matter how you choose to celebrate, we wish you a day filled with laughter and love. Happy eating!